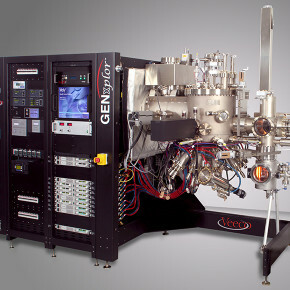 Veeco's award-winning GENxplor™ R&D MBE System uses Veeco’s proven GEN10™ MBE system growth chamber design and features unmatched process flexibility, perfect for materials research on emerging technologies such as UV LEDs, high-efficiency solar cells and high-temperature superconductors. Its efficient single frame design combines all vacuum hardware with on-board electronics to make it up to 40 percent smaller than other MBE systems, saving valuable lab space. Because the manual system is integrated on a single frame, installation time is reduced. The open architecture design of the GENxplor MBE system also improves ease-of-use, provides convenient access to effusion cells and easier serviceability when compared to other MBE systems. When coupled with Veeco’s recently introduced retractable sources, the GENxplor MBE system represents the state-of-the-art in oxide materials research.